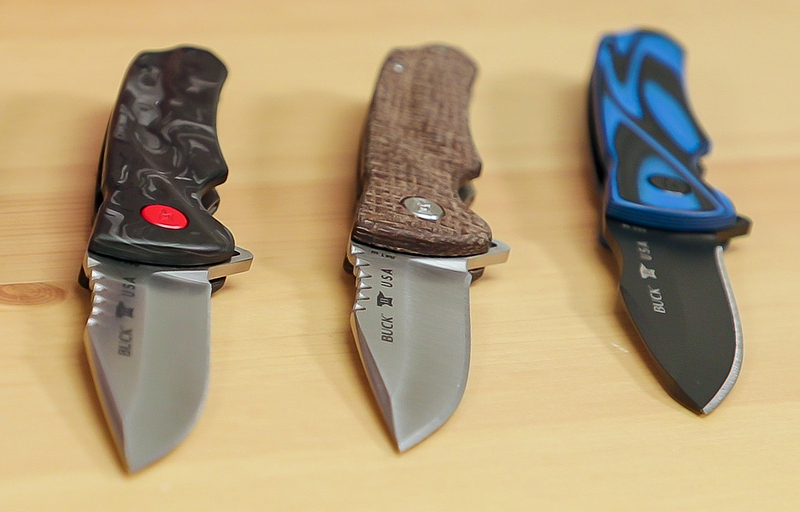 The Sprint family is a new ground-up design of liner-locking flippers, and they mark Buck’s use of a ball-bearing-based pivot system on their production knives. 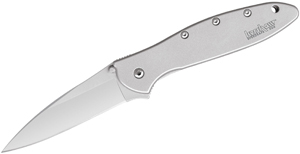 The result is a completely new feel for a “Buck knife.” The detent is not particularly strong, so it does require slightly more finger movement than some to deploy, but we’re actually fans of the action. It is still plenty quick, it’s very smooth, and it won’t tear up your finger if you like to fidget flip your knives. 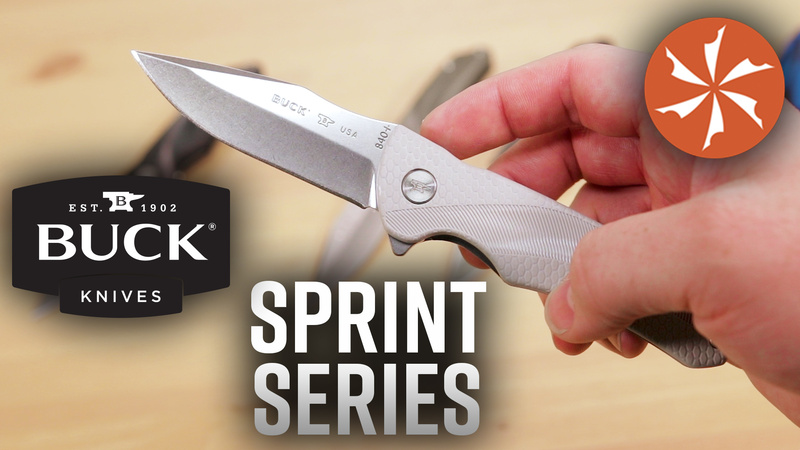 Like many other knives in Buck’s stable the Sprint series has two different tiers, Select for the budget conscious and Pro for those who want the absolute best performance. The Select Models feature lightweight Glass Reinforced Nylon handles that are textured and contoured in such a way that it fits very well in the hand and has the traction to make sure you maintain full control. 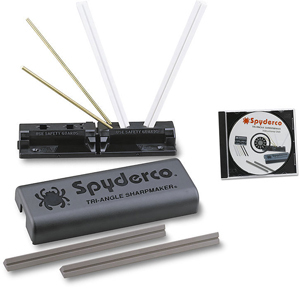 They are initially available with a few different colors – black, gray, or green – and each comes with a Cerakoted backspacer that provides a nice pop of contrasting color. Rounding out the handle we get a nice reversible clip, and while it isn’t truly deep-carry, it still maintains a low profile in the pocket. 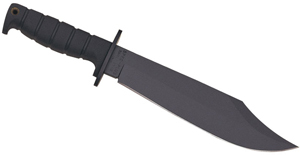 The drop point blade is just over 3-inches long, made from 420HC using Buck’s famous Bos heat treatment that allows this steel to punch well above its weight class. It features a stonewashed finish, which is one of our favorite finishes for working knife, that does a great job at hiding scuffs and scratches. With a hollow grind and a nice swedge, the Sprint will be a good all-around performer. Overall these materials are put together into one solid design. It is a perfect size for EDC with well thought out ergonomics. The handles index very nicely in the hand and you get the nice integrated finger guard thanks to the flipper design. There are also a few cutouts on the spine, both behind the pivot, and on the blade itself that works well for choking up with your index finger, or for getting your thumb behind difficult cuts. 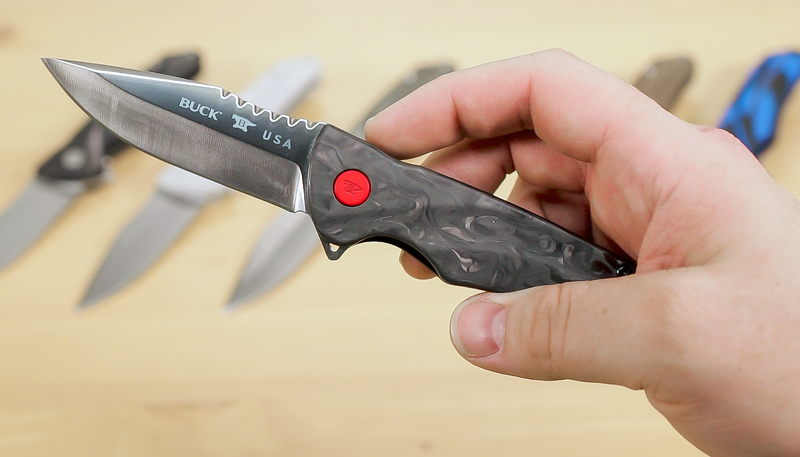 With all of the elements working so well together, the Buck Sprint Select makes a compelling case for itself as one of the best new budget knives to hit our shelves so far in 2019. If you step up to the Pro Models, Buck gives you the same great design and pivot system, but they sweeten the pot with upgraded handle materials and blade steel, getting a nice bump up to Bos heat-treated S30V with a satin finish for better edge retention. 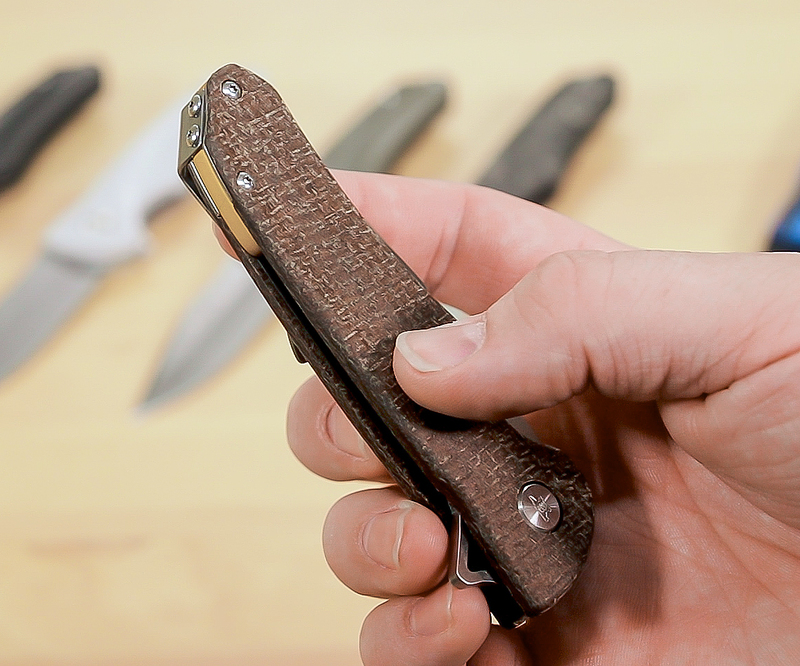 The first handle option is a nicely textured Burlap Micarta and it comes with a yellow Cerakoted backspacer. We also see a nice serpentine filework pattern on the spine of the blade, which not only provides a touch of class, it also adds traction as though it were jimping. Next up we have the Sprint Pro with marbled carbon fiber scales, one of the hottest materials on the market right now, and it features the same filework on the blade. Putting this version over the top is all the red Cerakoted hardware – the pivot and the pocket clip both match the backspacer in this case. 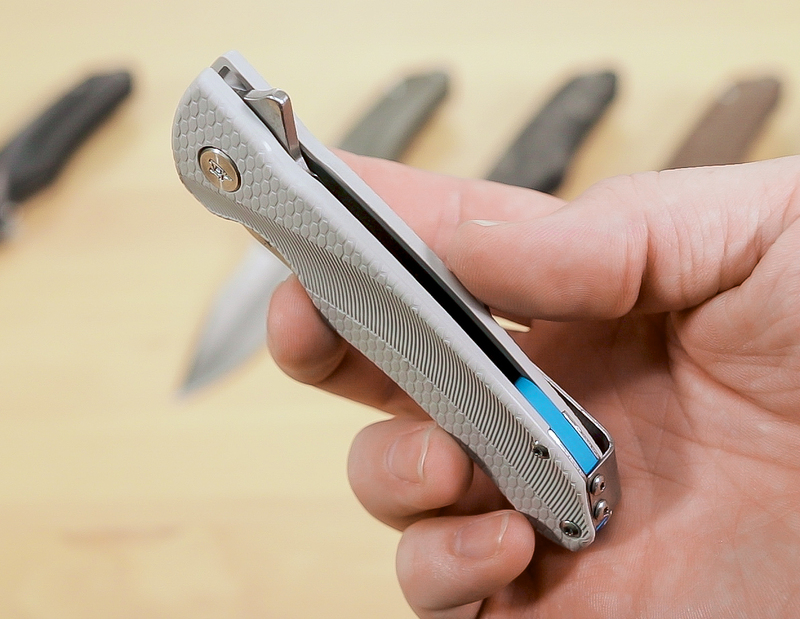 Rounding out the high-end versions is the Sprint Ops, which is rocking black and blue G10 handles and a slightly different blade shape – it is still a drop point but features a broader tip for more strength when used for piercing. We still get S30V steel but it now sports a black Cerakote finish, which will be hard wearing. The rest of the hardware is coated black as well – by eliminating nearly any surface that might glint in the light, this version will be appreciated by those who prize discretion. 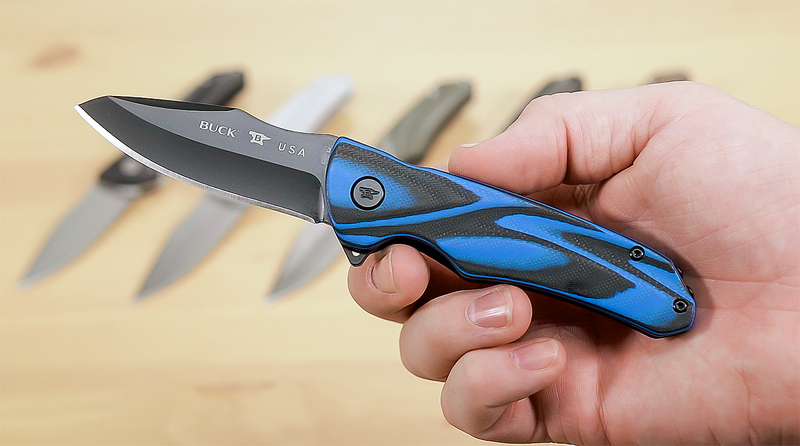 No matter which version you find yourself drawn to, the Buck Sprint series is a well thought out EDC knife that can run the distance, and it’s a nice jog forward from Buck. If you like what you see here and want to get your hands on one, click here in to head on over to KnifeCenter.com.